It was ML's birthday and for celebrations part 2, we were thinking of going to a watering hole but ended up in 'Supply & Demand' for dessert and drinks. 'Supply & Demand' occupies the spot that defunct Al Dente used to be at. I really love what they've done with the place! Where Al Dente was formal and trattoria-like, 'Supply & Demand' is industrial, quirky, woody and warm. 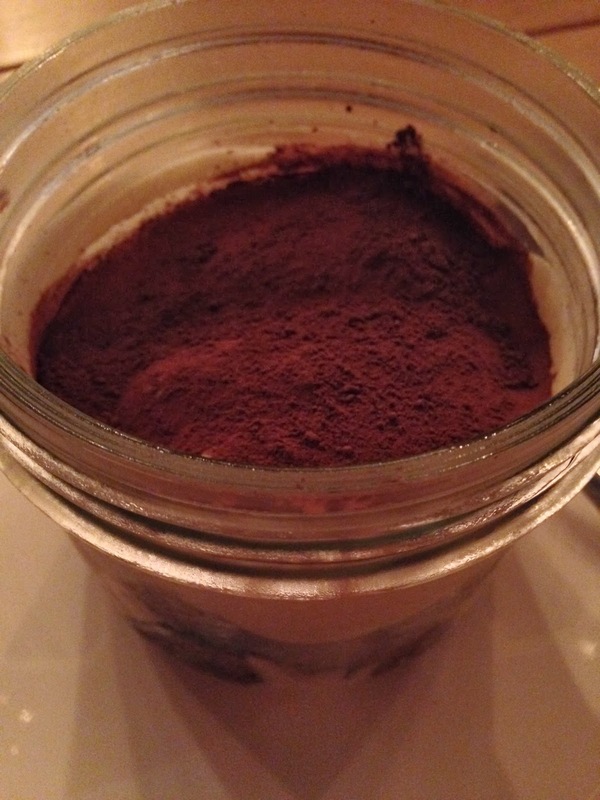 The tiramisu was pretty good and all the yummy alcoholic bits are right at the bottom so I suggest digging in deep. Next up was their lime & coriander cake. Coriander?!?! If your reaction was the same as mine, trust me...this cake does not taste of coriander. Reminds me of how basil is normally paired with strawberries. 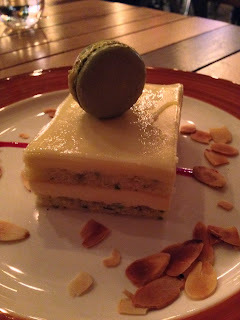 The lime was really the main taste so you only see coriander bits which gave the cake the green tinge. The macaron decorating the cake was just a plain pistachio macaron. 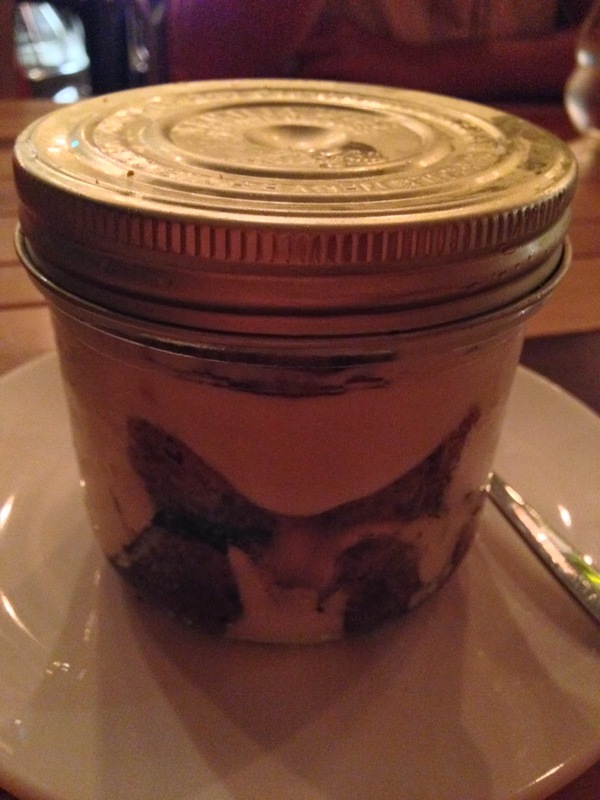 Overall, the cake was very light and refreshing. I don't mind sinking my teeth into the whole piece. Another dessert that came was their Chocolate Textured Cake. Sorry...don't really remember the name (will tell you why later). They wrote Happy Birthday in salted caramel!! Yums!! Ok, the reason why I couldn't remember the name of the chocolate cake was because we actually ordered another one BUT the staff gave us the wrong cake and we didn't realise it until half of the cake was eaten. Oops. Anyway, we clarified with the staff and because we had already eaten the cake, we were give 50% off the cake. The cake was good though. It's textured because there were cornflake-like bits in the cake and the chocolate centre was really thick. 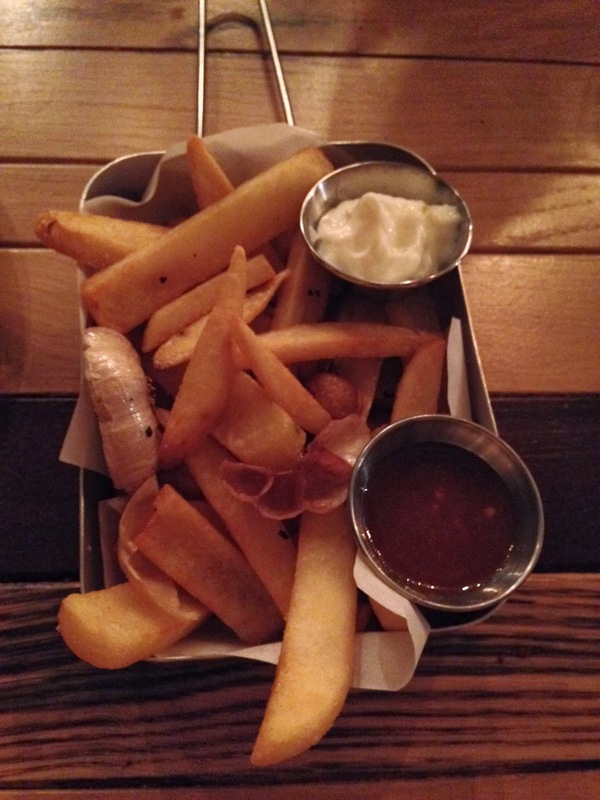 Well, we couldn't resist the call of garlic truffle fries....which came with a whole roasted garlic. This was part of our 'dessert' list. LOL. 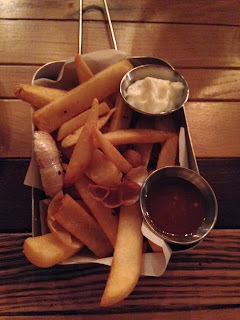 I was impressed at the hand-cut fries but was disappointed with the lack of truffle oil. The garlic bits were a nice addition but...I would pop over to Sauce (in the same vicinity) for their gorgeous truffle fries at only S$7++. Ok, turns out that 'Supply & Demand' is co-founded and co-owned by Wenqing's godsis, Jacelyn, who came over to talk to us later during our meal. She told us that she started the restaurant with her brother-in-law, who is one of the chefs, as well as other family members and friends, and that they're planning to open late and cater to the supper crowd. What great news for us Singaporeans who love to hang out late and chit chat over some drinks and snacks! They're currently open till 2am (Fri-Sat) but they're waiting for esplanade mall management approval to open till 5am. This is good news for those who either need a makan place after a show at esplanade or just seeking a hangout spot with friends till the wee hours of the morning. So...go on and try the food. They've got traditional favourites such as pizza and pasta too! The drink list is quite substantial too.